No matter the weather or time of year, you can help your space come alive with a Where Flowers Bloom Canvas. Mixed media craft ideas may seem complicated, but this project shows that they can be perfect for even beginning crafters. In less than two hours, you can start and finish this beautiful home decor piece and hang it on your wall. Use glue, paint and even tape to design your one a kind piece. Cover the canvas with ripped pieces of Podgeable Papers and adhere with Mod Podge. Once done, paint the whole surface with a layer of Mod Podge. Once dry, rub a few colors of paint randomly all over the canvas. Remove ribbon from the tags and set aside. Place tags inside an embossing folder and run through an embossing machine. Rub paint onto the raised surface of the embossed tags. Use a fabric marker to color the edges of the tags. Also with a fabric marker, color the ribbons. It helps to lightly spray the ribbons with water. Cut the shimmer sheets into small squares with 9 gems each. Some will be used as flower middles while others will be flowers. Turn and twist some Duck Tape while wrapping it in a circular motion to create rolled flowers. Add some texture to the canvas with stamps and rub-ons. 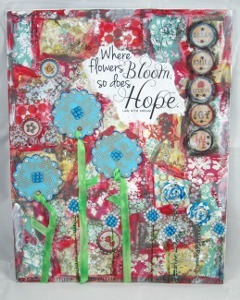 Add some cut out element from the Podgeable Papers and adhere them to the canvas with Mod Podge. Adhere all the piece to the canvas. For the gem flowers, add a different color of gems all around the square. Use Washi Masking tape and rub-ons to create some stems. Add desired title with Mod Podge.